At my district we are moving forward with implementing tools and policy to better serve the medical providers in the event of a critical incident at work. Athletic trainers do not normally deal with the death of an athlete, parent or coach. Even less often is when they perform life saving measures and still lose the person. We are not Emergency Department employees that see this daily and we also have a relationship built with those people. Please look into improving a really rotten situation before it happens. 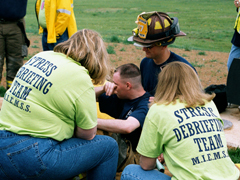 This entry was posted in Podcast and tagged Catastrophic injury, Critical Incident Stress Managament, CSIM, Death, health care provider, Perry Denehy, Ron Courson, Tine Koyen on May 23, 2016 by Host of The SMB.